1/29/19 Meria Interviews John Potash on his new film “Drugs As Weapons Against Us“. 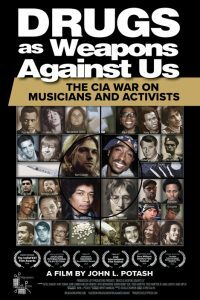 thanks to CIA,FBI, Police whistleblowers the truth about the war on US with drugs is revealed; Dave McGowan’s work; the Sacklers today’s drug dealers; doctors and their 2nd hand guilt; The “elite” family of drugs & bankers; HSBC & JP Morgan Chase; the Federal Reserve; eugenics; the racist genocidal movement; Nazi’s & MK Ultra; Ecstasy and the DEA; Afghanistan & Vietnam; what about cannabis? Timothy Leary-CIA agent; George HW Bush and the drug trade; rappers and drugs; infiltration; from John Lennon to Rappers..everyone should see this film. Like I always say “only thing I trust govt to do is kill us all”.